Online banking giant Amazon has this week launched an all-electric, self-driving autonomous vehicle that will manoeuvre across pavements and deliver customers orders to their door. The vehicle, to be known as “Scout” is about the size of a small cooler box and travels at the average speed of a person walking. 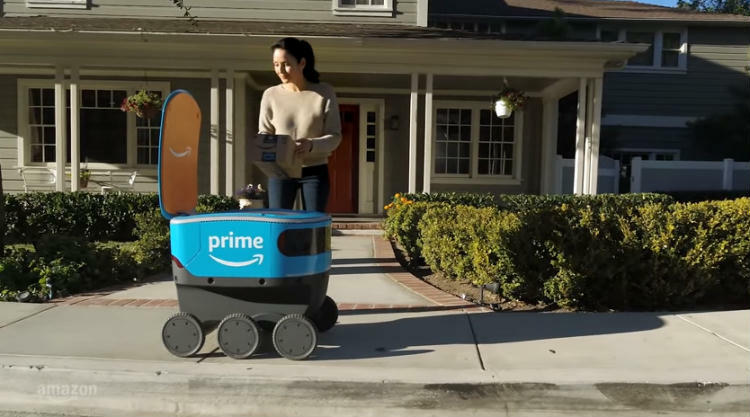 While Amazon says the roll-out of Scout will be extremely limited at first and will be accompanied by an employee at first, the machine is able to manoeuvre around typical sidewalk obstructions like pets. The system began delivering packages to a lone neighbourhood in Snohomish County in the US state of Washington yesterday. There the programme will start off with six Scout devices and will be operational during daylight hours from Monday through Friday. If it goes well, the Amazon employee will be removed and Scout will go off on solo delivery missions. While there’s presumably some built-in security to prevent random passers-by from just opening Scout up and just helping themselves to whatever package is inside, Amazon is yet to disclose that information.